And just like that one of the biggest events yours truly works on is over. Yup, I just wrapped up the American Century Championship Tournament (a.k.a Tahoe Celebrity Golf). 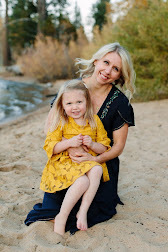 So without further ado here's the down and dirty recap of my last seven days! Tuesday-Thursday: The first three days of the tournament are all Celeb Pro-Am rounds. What does that mean? Well some lucky folks get to golf with celebrities such as Alex Smith, Michael Phelps, Stephen Curry and John Elway -- among others. 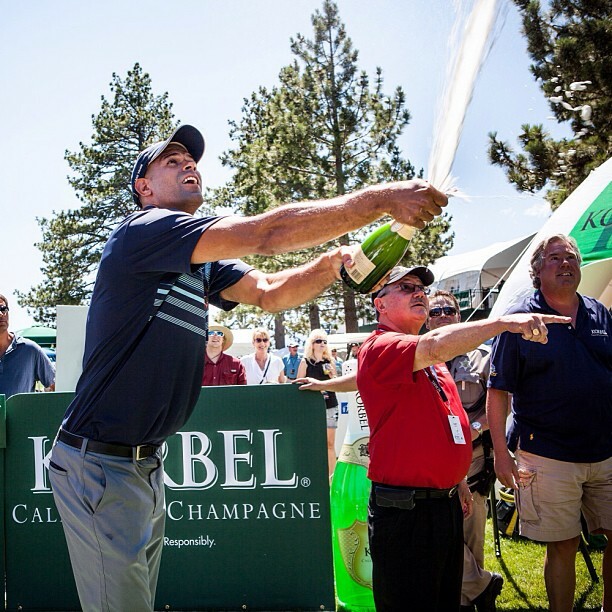 Sponsor events: For the last three years Korbel has hosted the "Korbel Spray-off" -- a contest to see who can launch their cork the furthest. 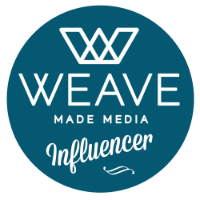 Wednesday was the media competition. Of course I participated, but sadly my 64 ft did not take first place. The celebrities competed Thursday and Shane Battier took first place with 100 ft! 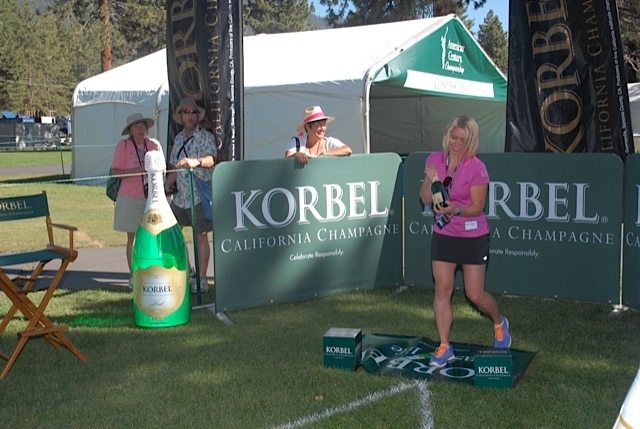 After the final Pro-Am round Thursday Korbel held a Hole-in-One competition on Edgewood's infamous Hole 17. No one made a Hole-in-One, but Bode Miller was closest to the pin at 10ft 11in. and used an 8 iron. 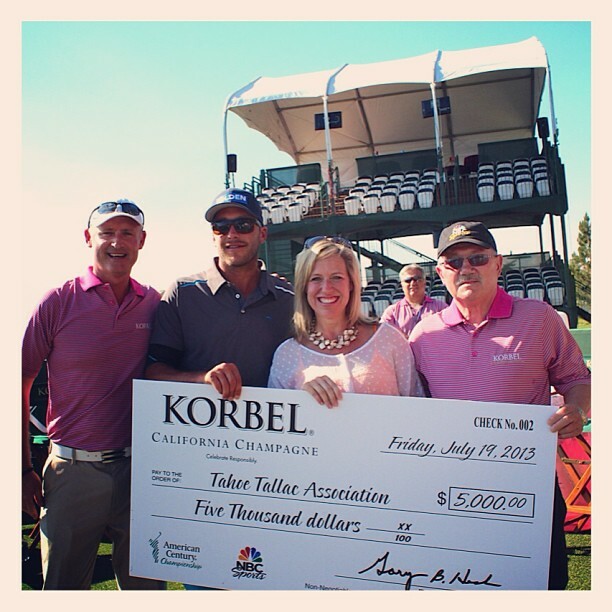 Korbel donated $5,000 to the Tahoe Tallac Association. Friday-Sunday: The tournament kicked off and there were a number of leaders over the three days -- Chris Chandler, Stephen Curry, Mark Rypien, Jeremy Roenick, Lucas Black, Billy Joe Tolliver and John Elway. Sunday afternoon was a nail biter. It actually came down to a tie between Mark Rypien and Billy Joe Tolliver! So how does one determine a win when there's a tie -- they play Hole 18 over and over until someone it determined the winner. In this case, after three additional rounds on Hole 18 Billy Joe Tolliver was named the 24th annual American Century Championship winner! Jeremy Roenick catches pass on Hole 17 from John Elway, then takes out caddie, and tackles tree. Killing it with my co-worker -- This was Erin's second year working on the event and my third -- season vets. Working with the amazing team at Edgewood Tahoe, America Century Investments and NBC Sports not to mention the hard working media. Media waiting on Hole 18 for the winning putt. Oh and I can't forget -- going to the Tim McGraw concert with my little bro. oh yah the tim mcgraw concert all around awesome! geesh 100ft, how did he win launching that cork so far?